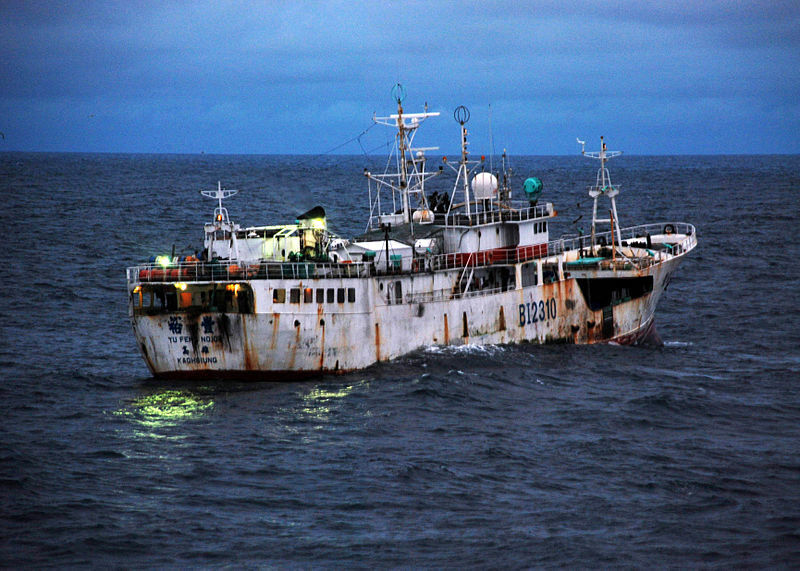 A Taiwanese-flagged fishing vessel suspected of illegal fishing activity. The annual global value of the fishing black market is estimated at $10 to $23 billion USD. Around the globe, illegal fishing threatens ecosystems, economies and human lives. Now, a new surveillance project plans to use satellites to find these fish pirates operating in marine sanctuaries near Easter Island and the Pacific island nation of Palau. The goal is to provide officials with the tools to identify illegal boats to either detain them or refuse them entry to port, driving up their operating costs and eventually putting them out of business. Project Eyes on the Sea, as the effort is called, is a collaboration between the Pew Charitable Trusts, a US based non-governmental organisation, and the private research centre Satellite Applications Catapult, which is backed by the UK government. Pirated fish are difficult to trace, but one 2013 estimate from the US nonprofit Oceana put the annual global value of the fishing black market at $10 to $23 billion USD – at least 20% of the world’s catch, threatening the economic livelihood of 260 million people. The illegal fish trade also ensnares humans, including children, who are trafficked and forced to work the boats. Project Eyes on the Sea uses satellites to detect transponder radio signals that ships transmit to identify themselves and avoid collisions. Its algorithms pick out ships whose movements seem suspicious. For example, a large ship that stops, pauses, then reverses course in the middle of the ocean may have rendezvoused with a smaller vessel to take on its illegal catch and refuel it. These smaller vessels often turn off their anti-collision systems to avoid detection. But with satellite images and radar, Eyes on the Sea can spot the sneaky vessels, alerting authorities in near-real time. Similar prototype systems from conservation groups Oceana and the World Wildlife Fund are built around the anti-collision signals too. But Eyes on the Sea has also negotiated with government partners to use data from transponders from another system, the Vessel Monitoring System, which are mandatory and harder to tamper with. One of the first areas they’re hoping to protect is Palau, where overfishing threatens the islanders’ way of life, said KB Sakuma, special advisor to Palau’s president. “In the evening, you can see on the horizon dotted lights of these illegal fishermen that come into our waters, fill their holds with our fish, our resources, our food security and go and sell it to the black market in Asia or somewhere else,” he said this week at the project’s announcement in Harwell, UK. Last year, Palauan president Tommy Remengesau Jr. announced the entire nation will become a marine sanctuary, banning all foreign fishing – and they hope to work with Project Eyes on the Sea to enforce it, said Sakuma. The project is also talking with Chile to monitor the waters near Easter Island and the hope is to expand to other regions over the next three to five years. This bobcat makes fishing for salmon look easy. While out fishing at a lake in central Tasmania recently, two locals caught something else entirely: a stranded hairy-nosed wombat. For the first time in more than a decade, the elusive and endangered fishing cat has made its presence known in Cambodia.